Everton’s Micheal Keane is seemingly the centre of interest in north-London as Arsenal and Tottenham Hotspur are both said to be eyeing the commanding defender’s signature. Joining the Toffees in the summer of 2017 from Burnley, Keane’s start to life at the Merseysiders was riddled with inconsistencies, although the 26-year-old centre-half has since forged himself an unmovable starting place within Marco Silva’s matchday fold this term. Featuring in Everton’s 2-0 victory against West Ham United at the weekend, a report published by Daily Mail revealed that representatives from the Gunners and Spurs were allegedly in attendance at the London Stadium, primarily to gauge Keane’s performance. 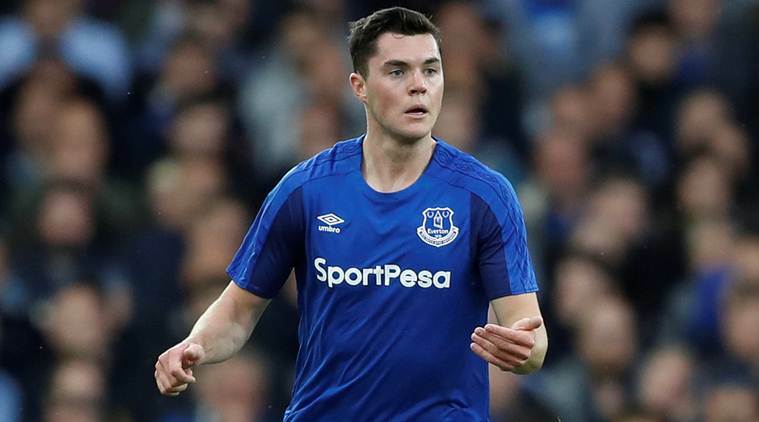 Keane has excelled expectation to date at Goodison Park and his hardened exploits in the heart of Everton’s rearguard warranted a call-up to England’s senior fold during March’s international break. Battling against Czech Republic and Montenegro, Keane registered his first England goal in Podgorica as Gareth Southgate’s ‘Three Lions’ swept the ‘Brave Falcons’ aside with an assured 5-1 triumph. Keane’s defensive dominance has been invaluable to Silva’s set-up’s prosperity this season, and as a result, he’s currently regarded as one of the Premier League’s most efficient centre-backs. Unai Emery expressed that signing sturdy defenders would be beneficial to his blueprints during the January transfer window but nothing, ultimately, materialised. The Spaniard’s devising his own legacy at the Emirates, a regime to contest the likes of Pep Guardiola’s Manchester City and Jurgen Klopp’s Liverpool in the not so distant future. Mauricio Pochettino, however, is supposedly fearful of losing Toby Alderweireld and Jan Vertonghen after the 2018-19 campaign comes to a close, so if Emery’s hoping to pip his touchline adversary to Keane’s accomplished services, he’ll have to propose a tantalising package that promises true leadership, responsibility and opportunity. Share the post "Everton defender centre of interest in north-London"